Does your drapery or curtain fabric smell nice and fresh? Or does it smell stale and repulsive? If you sense a musty or unfamiliar odor, it is time to call Big Red. Draperies catch a lot of household dust, soil, and odors. In highly urbanized Singapore, even high-rise condominiums and flats are vulnerable to the dirt and smog of the busy streets. Your draperies act as a filter, trapping dust and particulates from the gritty outside world. This is why it is very important to invest in professional drapery cleaning in Singapore. Even if you cannot see visible signs of dirt, this does not necessarily mean that your drapes and curtains are clean. A quick call to Big Red will freshen up your curtains in no time. 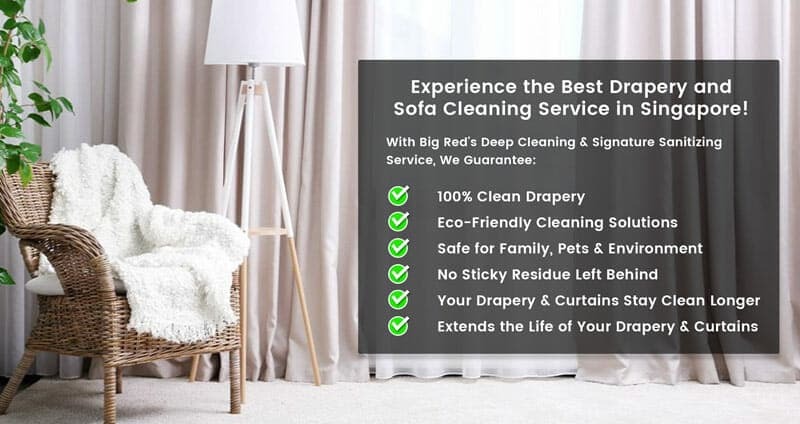 As Singapore’s drapery cleaning specialists, we provide professional cleaning services to remove dust, bacteria, allergens, odor, and any other particles from your drapery, while ensuring that the quality of the textile is protected. With our drapery dry cleaning expertise, we can remove contaminants and odors right in your home or office. The Big Red dry cleaning process will leave your draperies clean and fresh without the inconvenience of removing and re-hanging them. In addition, Big Red’s professional drapery dry cleaning services are designed to extend the lifespan of your curtains and drapes. Our method removes stains and particulates without harming the textile, while preventing any potential damage or shrinkage. Indeed, your draperies are in good hands with Big Red. Our 30-Day Big Red Clean Drapery & Curtain Guarantee! If you are not satisfied with the service from us, we will return to your premises with no obligations and re-clean any area you feel needs additional attention. It’s our 30-day, Big Red 100% Satisfaction Guarantee. services, call Big Red now at 6241 9443! Time to call Big Red! Copyright © 2019 Big Red Carpet Cleaners Pte Ltd. All Rights Reserved.